Once described as "Sherlock Holmes on The Love Boat", this late entry in the Holmes/Rathbone series deserves far more credit than that. 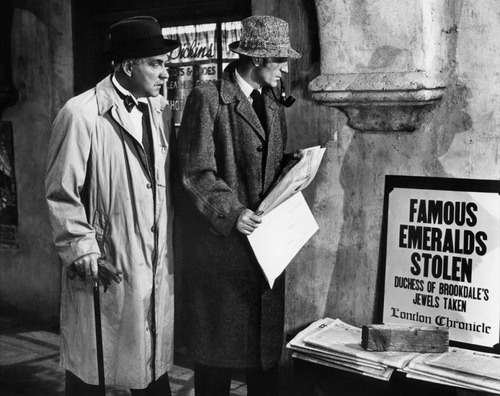 Holmes (Rathbone) and Watson (Bruce) are busy preparing for a much needed holiday to Scotland, when they are accosted on the street by a variety of mysterious oddballs, who seem intent on making sure our heroes are given a newspaper before availing themselves of a late-night trip to a local fish and chip restaurant. Watson is mystified, as per usual, but Holmes picks up on the hints, and soon they are embroiled in a plot to assassinate the would-be king of a small European country. Watson and Holmes are separated; Holmes escorting the royal target in a light aircraft, and Watson travelling on a passenger ship bound for Algiers. When news reaches Watson that Holmes' plane has crashed in the Pyrenees, it seems as though all is lost, but Holmes is one step ahead of the dastardly plot. Okay, so it does lack the pizazz of some of the earlier entries to the series, and is certainly lacking in period atmosphere. Yes, this is one of the updated Holmes movies, where the writers chose to place him in the (then) modern day to face the enemies of the time. Strange that the Rathbone cycle has been repeatedly criticised for doing this, when recent efforts to do the same have been so lauded. What each updating of the Holmes stories has gone to prove, is that the character does not necessarily need to belong solely to the Victorian period in order to make sense. His personality is timeless, and can transpose to the modern day without sacrificing the essence that makes him such a fascinating character to watch. It's easy to dismiss this film as a brisk little mystery with little to offer, yet if you look hard enough, you can see the effort that went into the making of it. Firstly, let's talk about that opening. Clues in a newspaper, in the words of discarded conversations, all lead Holmes to a secret meeting in Fishbone Alley. It would have been so easy to have had someone just slip him a note. Lesser films would have done so. 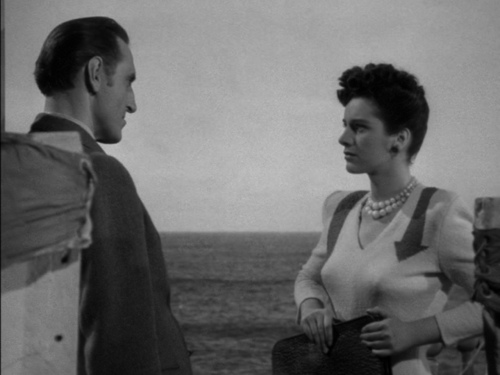 As for the supporting characters, the luminous Marjorie Riordan stars as an American nightclub singer, turned unwitting criminal in a plot that harks back to a throwaway crime in the early stages of the film; Martin Kosleck as a sneering knife-throwing assassin; perennial series star Gerald Hamer as a timid passenger in pursuit of "the body of a King", and Rosalind Ivan as Agatha Dunham, a fitness fanatic intent on interrupting Watson's relaxation. In the beginning scenes, Holmes and Watson are seated in a restaurant, only for Watson to be approached by a "lady of the night", whom he dismisses. She is heavily made up, and seems to be eavesdropping on their conversation. Pay attention to a certain phrase she uses repeatedly, and then listen for the callback later in the film. Details like these elevate certain characters from obvious red-herrings, as in most of the Holmes series, to genuine villain contenders. That it lays these clues in such a subtle way, is to its eternal credit. Whilst on board, Holmes finds himself having to deal with not one, but three assassins, each employing a different means of disposal. 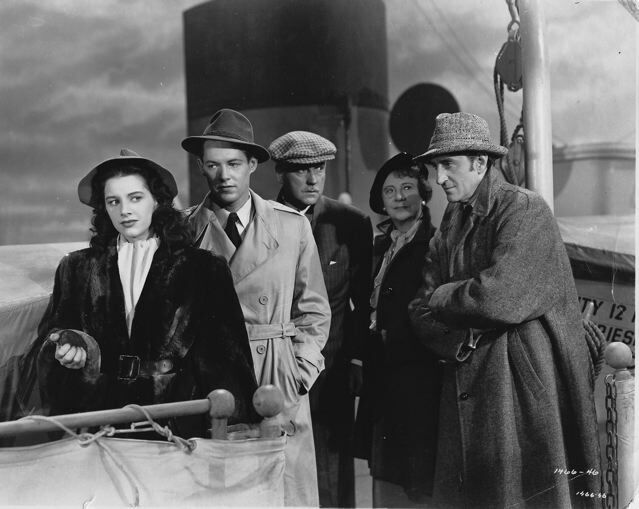 Whilst they're hardly worthy of Moriarty in their calculation, they're a fun and diverting break from the usual routine of interview-then-chase found in many mysteries of the forties. It helps that the whole film isn't tasked with discovering the identity of the protagonists, but with Holmes's repeated foiling of their attempts. Nigel Bruce, bumbling as ever, is tasked with watching over the royal quarry by passing the young man off as his nephew, but even he is allowed to shine, such as when the news comes in that Holmes has come to his end. There are no histrionics, no melodrama. Simply a sudden, weary defeat. He walks, deflated, to the deck of the boat and quietly takes a moment. Basil Rathbone, also, is an altogether warmer Holmes here. He attends a dinner party, a wry smile on his face as Watson regales the assembled guests with the tale of The Giant Rat Of Sumatra, albeit whilst deducing that a murder is about to take place by noticing that a name has been mis-spelled. His deduction that Watson has met a "brunette" is followed by an affectionate grin as he explains that "I pay sufficient credit to your good taste, to take the beautiful for granted". He even jokes about his appearance when a suspect runs away from him in horror. Another criticism sometimes levelled at the film are the songs. To be perfectly honest, they're not only brief, but I consider them rather delightful. Even Watson gets to sing, and rather well too. It's not a musical, it just features a couple of ditties, and they don't outstay their welcome or take up too much room. To top it all off, the film also features a rather neat twist ending, which I won't even hint at for fear of ruining the surprise. Look, it's not high art, but it is a romp. It's light on mystery, heavy on incident, rocks along at a breezy pace, and packs more set pieces into its sixty-five minutes than most of its contemporaries managed in ninety. And it even manages a song or two. Holmes purists will never warm to it, but let's face it. The Rathbone/Bruce films were never for the purists. Pour yourself a glass of wine, relax into your favourite chair and allow yourself to be entertained by an amiable, enthusiastic piece of entertainment. Just wonderful.